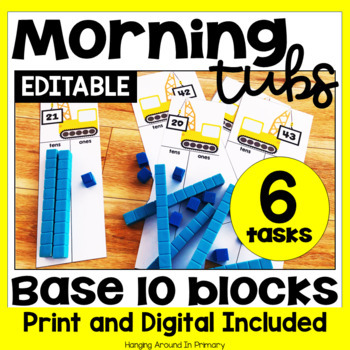 Start your day in kindergarten and first grade with morning tubs and let your students socialize, play and explore to ease them into the day with these Base 10 Morning Tub Tasks. Using morning tubs for morning work is a great way to let you students work on important math skills in a playful way. This Morning Tub is also available as part of a money saving BUNDLE. You can check out all the sets included and save money by purchasing the whole set here: Morning Tub Tasks Growing Bundle. The goal for my morning tubs is to create activities that use common classroom manipulatives and items. They are low - prep; just print the student pages or instructions and you are ready to go. 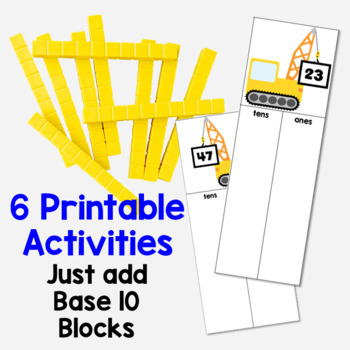 This set contains 6 different activities to be used with base 10 blocks. There are detailed teacher instructions for each center. Numbers under Construction: Students will choose a number construction card and choose the base 10 blocks needed to construct that number. Make a Picture: Students choose a maker card and use base 10 blocks to make the picture. They record the number of tens and ones used and then write the whole number. Laminate these cards for continuous use. Spin and Cover: Students will spin the tens spinner and then the ones spinner to create a number and then cover that number on a 100 or 120 board. Provide base 10 blocks so students can build the number as well. Roll, Build and Compare: This activity is for 2 students. Students will each roll the dice once to choose the number of 10s and then the number of 1s. Students build the number on their board and compare. The student with the biggest number wins the round. 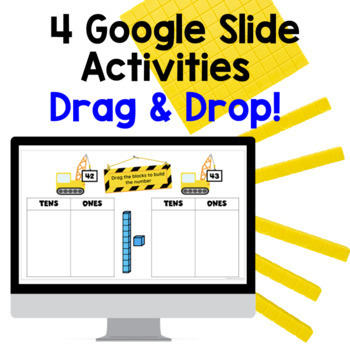 Laminate or put in a dry erase pouch or page protector for continuous use. Race to 100 / 120: Students use the tens spinner and ones spinner to create a number. They take the number of tens and ones blocks and then place the blocks on their game board. If needed, 1 ten can be broken up into 10 ones and vice versa. The object is to cover the entire 100/120 board with the base 10 blocks. This game is best played with a partner. Build a Number Challenge: Students choose a card and read the directions to build a number that fits. 8 cards have 1 correct answer and 8 cards have a range of possible answers. Leave feedback on this item to earn credit toward future TpT purchases! Be the first to know about my new products and freebies! Look for the green star near my store name and click it to become a follower. You will receive customized e-mail updates about my store!